As human beings, we are faced with many threating possibilities such as illness, accidents, rejections, unemployment, war, loss of our significant relationships, and other kinds of suffering. Living our lives in an unpredictable world where things happen unexpectedly can make us feel vulnerable; therefore, vulnerability is part of life. No one, no matter how rich or famous, can escape the reality that we are not in total control of what can happen to us. When we don't accept this, we develop unrealistic expectations of ourselves. We can feel shame for simply being a human being and having limitations when it comes to dealing with events that we cannot foresee. 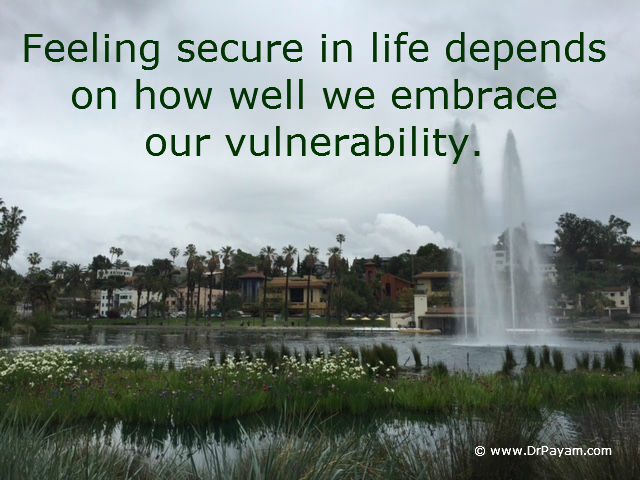 Our ability to feel secure in our lives depends on how well we embrace our vulnerability. Putting this concept in perspective is the focus of this short article. Many of us don’t know how to help ourselves to feel safe in relation to life’s uncertainties. Instead, some turn to addictions or other mind-numbing behaviors in order to cope with scenarios in which they feel vulnerable. Others seek wealth and power to compensate for their powerlessness over life. Not knowing how to deal with our vulnerability limits our ability to take risks and live a fuller life. We can't passionately explore the mystery of life and live meaningful lives when we become paralyzed by our fear of vulnerability. When we find the courage to face and accept our vulnerabilities, we can accomplish enormous tasks in life. As a psychotherapist with empathy for our struggle to feel safe in this troubled world, I believe it is important to access our transcendent Self, which can help us to witness our vulnerability and at the same time allow us to navigate through life with grace. The transcended Self is connected to a force beyond our limited ego; beyond anything our mind can imagine. Connection to the Self can make it possible for us to ask for help from a force or a power greater than ourselves. We can feel less alone navigating through unpredictable life events when the Self facilitates our relationship with such a powerful force. When faced with a vulnerable situation, not only do we need to rely on our courage, but we also must have the willingness to ask for help from the power greater than ourselves. Access to the transcended Self can be granted through psychological inner work and paying attention to the wisdom that can be revealed through dream work and meditation, and by the knowledge that can be found in psychology, spirituality, mysticism, and other sources. Moreover, we can engage in meaningful practices such as mindfulness, random acts of kindness, and serving humanity in times of suffering. All of these practices can facilitate encounters with the Self. When we engage in a psychological journey within and work through unresolved issues that limit our minds and cover our hearts, we are on our way to making an encounter with the transcended Self. "O seeker without the shadow of a pir (teacher) the clamor of the beast will torment you." "Do not take a step on the path of love without a guide. I have tried it one hundred times and failed." A meditation that focuses on love energy in your heart is an intoxicating way to remember the God of your understanding and deepen your connection to Him / Her. At the same time, it is important to note that not all organized religions are oppressive. In fact, there are many people who have had positive religious experiences, and they turn to praying in troubled time. People should never take their freedom of religion for granted. We all need to be respectful of each other’s chosen path, as long as one’s faith does not involve hatred and violence. In addition to rely on a Higher Power, we can also do our individual part to embrace vulnerability. Embracing our vulnerability requires us to become grounded and cultivate humility. Knowing that we are “at the mercy of the physical world” and letting go of the things we cannot change can help us to become humble and grounded. It is liberating to deal with vulnerability when we come from place of humility. Having humility makes it easier to ask for help and not feel the pressure of facing everything by ourselves. It takes courage to reach out and seek support from others when we experience suffering. Everyone’s pain is unique, and no one deserves to suffer in silence. Reaching out and asking for help is a courageous act that people can do in response to their emotional pain. It is also an example of being brave and letting ourselves be seen in such a vulnerable state of suffering, without hiding out of shame. Practicing mindfulness can also help us deal with vulnerability. For the most part, mindfulness involves bringing our complete attention to our present experience on a moment-to-moment basis with acceptance and compassion. In particular, we can observe our physical, emotional, and mental experiences with kindness. We pay attention to whatever is happening in the moment, and we can use our sensory awareness to stay fully present. For example, when we wash the dishes, we can see and feel the soapy water on our hands. Paying attention to the sensation of water on our body during a shower and noticing the taste of our food when we eat are also examples of being mindfully present. When we practice mindfulness, we are in the moment, and we don’t get lost in our worries. We can rely on mindfulness to witness our vulnerability with compassion and without judgment. In summary, we may put our vulnerable existence in perspective by accepting it and taking measures to make ourselves feel safe. These measures include seeking support, training our mind to stop worrying about the future and live in the moment, connecting to our inner strength, and asking for help from a power greater than ourselves. What a relief to know that we don’t have to put pressure on ourselves to do the impossible task of controlling every aspect of our life journey.